“Shifties” Matt, Marcelle, Chris, Kristina, Sam, Patrick, Gavin, Giles and Gar have decided to take on “The Color Run” at Wembley on the 8th of July as part of our commitment to the Pledge 1% initiative. 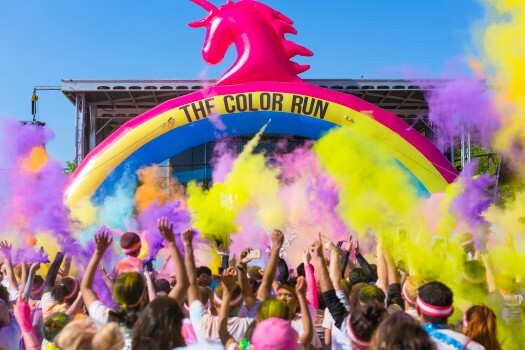 The Color Run was set up to be an active healthy event for all ages to take part in and raise money for charity and is also said to be the most fun 5k in the world. With CloudShift being so busy at the moment only the most perfunctory of training has taken place but it’s the taking part that counts! We are aiming to raise money for our chosen charity, Shooting Star Chase. CloudShift nominated Shooting Star Chase to be our charity for the year, all our fundraising throughout the year will be donated to them. Shooting Star Chase is a children’s hospice charity who support children with life-limiting illnesses and their families. The amazing support they provide spans from diagnosis through to end-of-life and even helping with bereavement for those left behind. The care is not just medical but also includes practical and emotional help to provide 360° support for the young people needing their help. The care they provide is free of charge and available 365 days a year. The care service includes short breaks at their two hospices (Shooting Star House in Hampton and Christopher’s in Guildford), as well as Hospice at Home, daycare, symptom management, end-of-life care, bereavement care and a comprehensive range of therapies and support groups for the whole family. It costs £10 million a year just to maintain the current level of care with only about 10% of funding coming from the government. This is why, Here at CloudShift, we believe it is so important to put our effort, time and money behind charities like Shooting Star Chase. We also firmly believe initiatives like pledge 1% that influence culture to make giving back normal are so important. There are many more families in need of the support that Shooting Star Chase provide and here at CloudShift we hope that our efforts and contributions will help more families in need get support. If you would like to donate some money, please follow the link to our “looking shifty” just giving page.